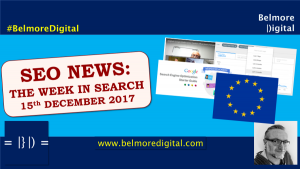 The most important, or interesting, organic search updates from week-ending 28th April 2017. In their latest steps to combat “fake news” and offensive content, Google rolls out Project Owl incorporating significant search updates across several areas. 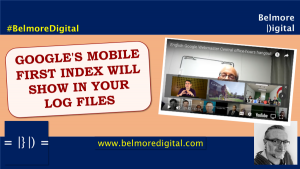 Updated Search Quality Rater Guidelines – updated to call out low-quality webpages. 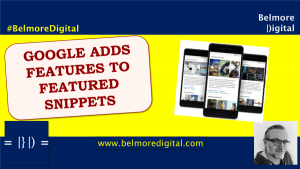 Algorithm changes – designed to demote low-quality content and surface more authoritative pages. Updated info in their Help Centre and their How Search Works site. Use the Feedback Tools to report those issues to Google. It is not known how long / successful this process is. Avoid creating content which is inaccurate or offensive. Always research content and present balanced arguments. Pure polemic content should be expected to be gamed by opposers. 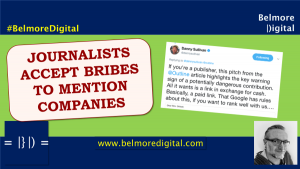 Smaller content providers and opinion promoters will need to work harder on becoming authoritative. Fake news and offensive content is a big issue for the major deliverers of news and information, Google and Facebook. This is something like the 3rd or 4th major fake news steps taken and announced by these companies. There is no doubt is it a pernicious problem, which challenges their common carrier / neutral observer status and goes against the freedom of mixed views they would like to promulgate. It will be interesting to see if their results become much more anodyne as a result of these actions. We can expect significant gaming of these tools to take place due to the joys of human nature. Fake news will generate fake news reports and fake feedback. Some news can be objectively tested (although not if you believe it’s all an MSM conspiracy) and this will mainly allow non-fake news to remain surfaced. It will be interesting to see if companies and individuals have success using the feedback tools to “edit” the search results. It’s worth a go, but the efficacy of the action is unknown. There is also a chance of a chilling effect on opinion. If news services and content providers become more anodyne to escape the risk of being reported, this will cause a dulling of the internet. 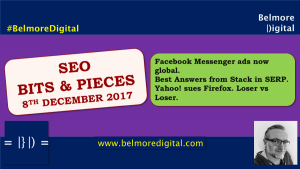 It also means that smaller / newer content providers may find it even more difficult to be found in Google Search as a result of not being authoritative enough. Clearly the MSM Cabal is at work. Ratings and reviews are being used to rank businesses for “best” and other qualifying queries. Results are pre-filtered to 4 Star Ratings and above. Appears to demonstrate Google’s desire to incorporate reviews and ratings in their local listings. No evidence (yet) of an interplay with proximity markers. This hasn’t yet rolled out to every locality. 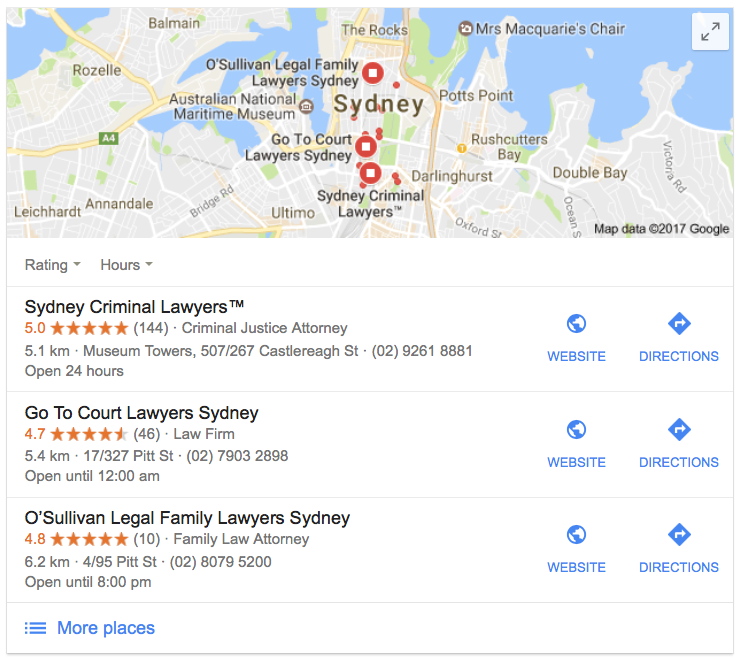 If targeting generic local search terms, eg “lawyer”, “dentist” etc, test what happens if qualifiers are added to the search query. Work on getting good reviews on Google and other sources from clients, including strong ratings. Work to change poor reviews into good reviews. Ensure at least one person in the business is tasked with managing reviews and ratings – tracking, encouraging, and influencing. Don’t leave it to the intern! 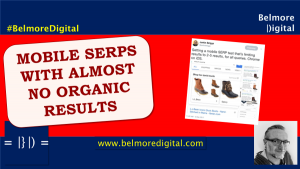 Local SEO has been fairly quality agnostic for a while, Google has tended to list the scores and leave the click decision to the user. However, this starts to mark a shift into the quality of local results – after all, very few people actively search for “rubbish lawyer”. There have also been a few shifts recently in how star ratings are taken account of in the ranking algorithm. 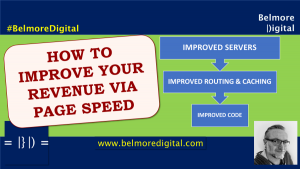 The indications are that “quality” is the next evolution in the local search business – time will tell. Once your local strategy is sorted (not overly difficult), the management of reviews and star ratings becomes the next critical point of failure. If your business does not have a specific person whose job it is to get better reviews, it will become essential to have one – who it is will be up for debate, but usually someone who is invested in the business’s success would be a good starting point. 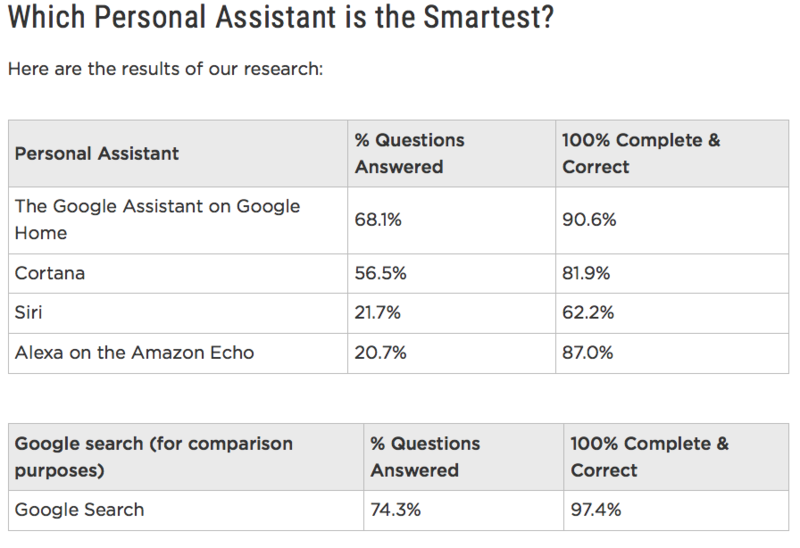 Stone Temple Consulting conducted a virtual assistant test to discover which of Google Assistant, Siri, Cortana, Alexa on Amazon Echo performed best in Answering a Question and whether the Answer was 100% Complete and Correct. Google Assistant performed strongest, Cortana came second, Siri and Alexa trailed a long way behind over 5,000 questions. This was a strong performance from Google with a surprising lack of performance from Siri. Note the sources of information for each service. Ensure that questions users might commonly ask of your brand can be found on those sources (and on your own web properties). Virtual Assistants and Voice Search are the next big thing. 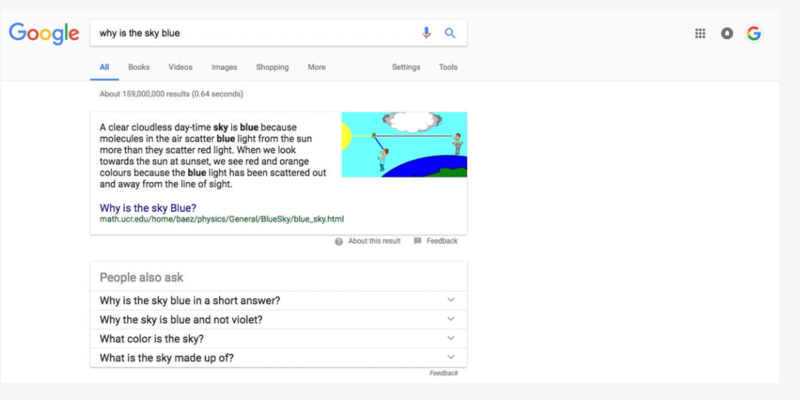 We’re constantly using our phones, or Home Assistants to find “stuff”, but we hate typing, and there’s a lack of trust in the search results. 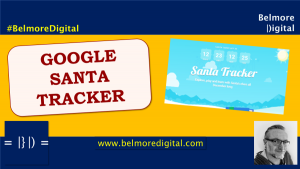 It’s not a surprise that Google leads the pack. 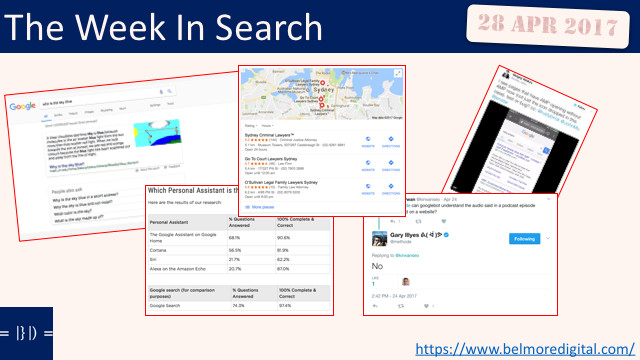 We already know their search leads the way, and their voice recognition is pretty good too. That would also go someway to explaining the second place for Cortana, even if Bing’s results can be a bit of a mixed bag at times. Siri and Alexa’s recognition of questions was surprisingly low. This could be because their view is that they are not primarily search devices, they are transactional devices where the voice interaction is command rather than query driven. Their search services are also far more likely to be thrid-party driven as well. Having said that, I suspect my family would recognise the frustration of me repeatedly saying “Hey Siri” and rephrasing the question to get the answer I want. I haven’t resorted to SHOUTING … VERY … SLOWLY … yet. Reports in the wild have Google *not* displaying AMP results on mobile search for some queries. It’s possible this was a blip or a test, or just an individual ripple in the continuum. Google does have a track record for promoting a framework then mothballing and finally terminating it. 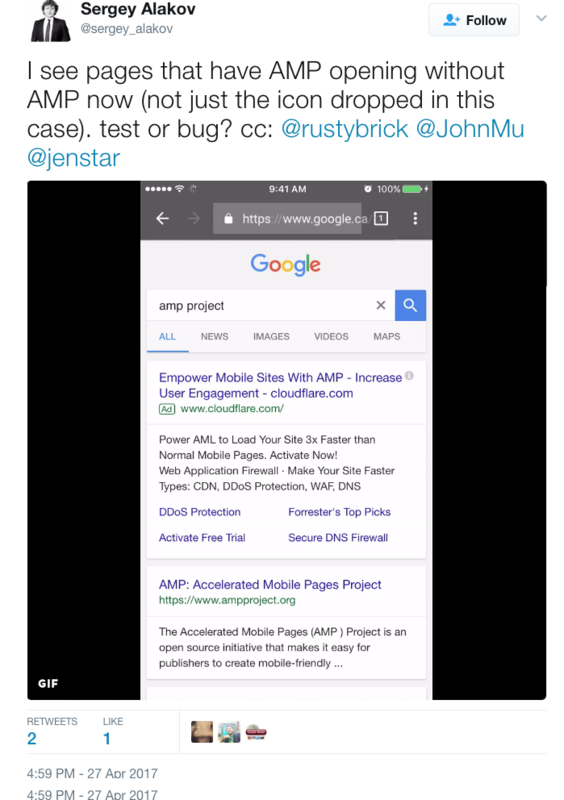 Don’t give up on AMP just yet, it has significant backing and AMP has recently rolled out to Asian search engines. Ensure your AMP pages are coded and tagged correctly. Anyone remember the rel=”author” debacle? Google’s previous move into a new way of graphing the web started with a fanfare, stuttered and finally fell in a heap a few years ago. There is always the chance this could happen again. However, this is unlikely in this instance as Google has a monetisation route for the framework (allowing Google Ads to run on the pages), although I have read recent mutterings re the Facebook version of Instant Articles which are not delivering desired financial results for publishers. AMP is technically a bit of a challenge to implement. It is definitely a pain to maintain separate codebases for pages and rely on canonicalisation to sort out duplication issues. Surfing is quicker on AMP, but it is a less beautiful and less rich experience. 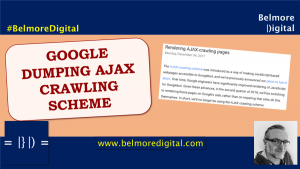 Ultimately, Google will decide whether it keeps it based on whether users interact or avoid it in search, if users get benefit from it, by either reading more articles or, essentially, viewing more Google Ads. 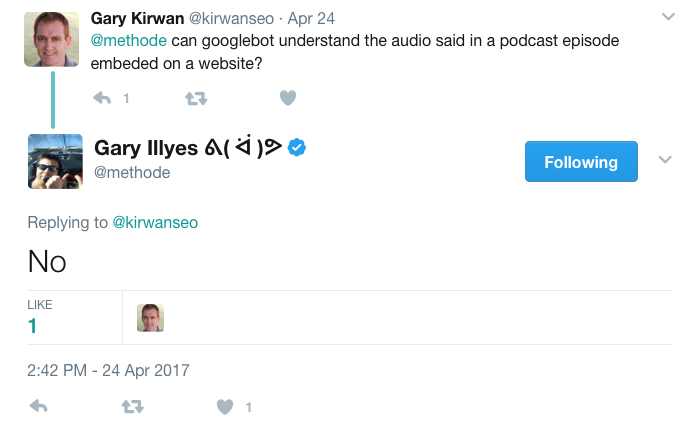 Gary Illyes responded with a resounding “no” when asked if Googlebot can interpret audio in a podcast file. This means it is also likely that Googlebot doesn’t interpret audio in video files on site as well. (YouTube does, but embedded YouTube files pass no value to the embedding page). Put the transcription into an accessible layer underneath the file – very useful for accessibility software, and Googlebot. Use descriptions and other text to ensure that there is a good representation of the audio content of the file in the HTML and surfaced on the visible page. You would think that Googlebot would be able to interpret audio files and include them in the ranking algorithm, even though they only ever really make a half-hearted attempt at decoding PDFs and other format files. 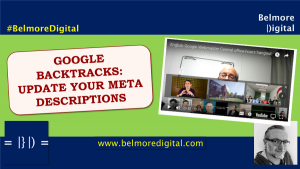 Using transcription, or extensive descriptions should be second nature to anyone delivering great content in self-hosted video or audio, and hoping to be found in Google Search. Giving this content also helps accessibility browsers to interpret and deliver the content for their users. Note that this is the case, even though Google has included podcasts in its Rich Cards schema. Google has no plans to boost the (already minimal) HTTPS ranking factor. Just too quick to bother closing / skipping? Or just incredibly popular and loved by users? More than 1600 changes in search last year. That’s a lot of tweaking, testing & launching! The Googlers have been busy.